The Global Wellness Institute has announced the eight key trends it says will shape the wellness industry in 2017 and beyond. The trends, identified at last year’s annual Global Wellness Summit, examine future shifts across categories including travel, spa, beauty, fitness, nutrition, technology, medicine, and architecture. With a focus on the future of the wellness industry, according to the Global Wellness Institute, each of the eight trends identified have a “get real” quality, with the potential to change the way we live our everyday lives. From the democratization of wellness, to the health implications of the indoor environment, for an overview of the trends set to transform the wellness industry, carry on reading. According to the Global Wellness Institute, the disconnect between Northern, Central and Eastern Europe, where sauna-going is a way of life, and the rest of the world, is beginning to disappear. Set for a dramatic transformation, the rituals and facilities associated with sauna culture will become far more creative and social, as the rest of the world catches up with the benefits of the age-old practice. Paving the way, Hot Box Sauna, located in Scotland, boasts panoramic views as well as a bar and live music, while over in America, a number of trendy urban ‘sweat lodges’ such as Shape House are making headlines. Claiming to burn calories, deepen sleep and improve skin, Shape House uses infrared sauna technology to get the body to sweat at a lower temperature in order to boost the treatment, a practice that has already achieved a cult status. The Global Wellness Institute argues that as the need for social and fun experiences intensifies in our ‘Age of Loneliness’, wellness experiences connected to sauna culture will increase, as businesses look for new and innovative ways to meet consumer demands. As architecture begins to move away from its preoccupation with surface aesthetics, thanks to new standards and technologies, architects are beginning to design buildings based on their possible effects on human health. According to the Global Wellness Institute, this new ‘wellness architecture’, will be one of the biggest (and most impactful) future wellness trends, with strategies ranging from the inclusion of more plant life in offices to the creation of entire homes built around the inhabitant’s personal wellbeing. With innovation set to head in all directions, the report highlights ‘living’ buildings, with algae embedded in their walls that grow all their own energy, as well as Cradle to Cradle’s buildings, which are made of clay and wood, so they can return to the earth when their life is over. Arguing that hotels and wellness retreats need to be leaders in the wellness architecture revolution, the Global Wellness Institute predicts that in the future our buildings will be designed from their blueprints up, in order to make us healthier, happier and more alive. 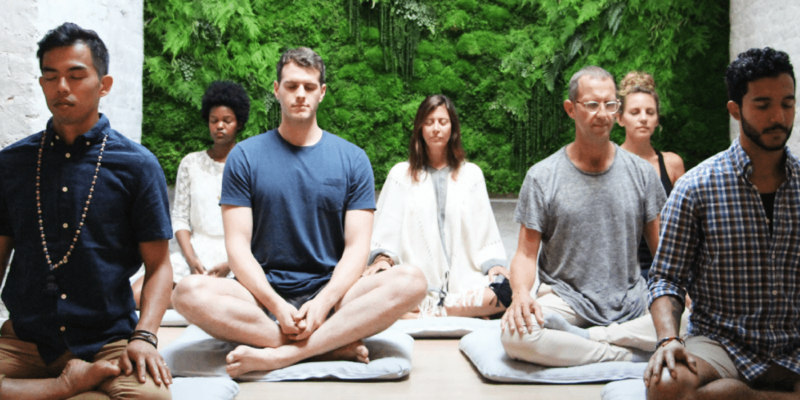 As digital noise and connectivity reaches an all-time high, the Global Wellness Institute predicts that we will see a sharper focus on silence, mindfulness and nature. From new ‘silent spa’ models to silent zones at restaurants, gyms and even airports, Tom Bauer, COO at Vamed Vitality Resorts argues that time, space and silence will be the most precious future luxuries, and that retreats like theirs will need to offer services that help people restore inner silence. Answering the desire for silence, the Mandarin Oriental has already launched a brand-wide “digital wellness” initiative, in which guests are encouraged to forgo their phones and follow a wellness regime developed by the Mayo Clinic. As technology escalates, this type of brand proposition will become even more powerful. Taking inspiration from the phenomenon that is adult-colouring, the Global Wellness Institute predicts that the practice of art and creativity will become even more central to the future of wellness. Citing creative pursuits as key to mental wellness, the report suggests that we’ll start to see more classes and programming that encourages people to embrace their creative side, whether that be dancing, drawing, writing or learning. According to the Global Wellness Institute, destination spas like Canyon Ranch have long offered classes in creative arts, however as the trend toward more performance-based activities at wellness destinations increases, more mainstream brands are taking steps to incorporate creativity into their offerings too. Driven by consumers having a better understanding of the relationship between creativity and mental wellbeing, initiatives such as complimentary in-room colouring books found at hotels, or nights of painting under the stars offered at retreats, will be given greater prominence by brands when marketing their wellness offerings. As the notion of beauty from the inside out continues to shake up the beauty industry, the report argues that the convergence of beauty and wellness has created a new aesthetic of beauty that has nothing to do with shape or size. Sparking a consumer revolution, looking good, feeling good and even doing good is all part of today’s beauty aesthetic, according to the Global Wellness Institute. And, as such, demand for ethically sourced and natural products with a personal story, is rising. The report predicts that “big beauty brands will continue to acquire niche brands – like L’Oréal’s $1.2 billion acquisition of IT cosmetics, and Unilever’s purchase of premium, clinical brand Murad,” in a bid to connect to today’s consumers and help boost revenues. The ingestible beauty market will also advance, as consumers turn to prevention rather than repair. Predicted to be the biggest future trend of all, thanks to an “alarming mental wellness crisis”, the Global Wellness Institute argues that spas, fitness studios, workplaces and governments will start putting more emphasis on helping consumers to tackle stress, depression and anxiety. Suggesting that, “as wellness tourism developed alongside of, yet distinct from, medical tourism, mental wellness will develop alongside, and distinct from, mental health,” the report argues that mental wellness will form a new wellness category, with businesses creating innovative paths to emotional wellbeing and happiness. From sleep pods and drop-in meditation classes at MINDFL in LA, to mystical concepts such as Shaman Purification Rituals at Tierra Santa Healing House in Miami, wellness for the mind is on the cusp of a meteoric transformation, and these innovative concepts are already riding the wave. Although wellness still has a long way to go in the inclusion of cancer care, initiatives such as ESPA’s Nurture & Support programme, which has been designed to help relax, nurture and support guests who are dealing with cancer, are becoming more commonplace. And, in the future, the Global Wellness Institute predicts even more wellness businesses will pursue cancer-focused education to train staff, enabling them to offer models of wellness that cater to those with the disease. In doing so, the report suggests that more businesses will start to launch charitable initiatives, more affordable products and services will emerge, and wellness tourism will shift from high-end resorts within walls to destinations where more authentic experiences can be found. Getting real about what true wellness is and should be, the wellness businesses of the future will be more sustainable, with consumers driving the transformation.